Home Life Gonna bring your records? Yes, it’s here again. National record day. Dig out your cassettes, your vinyl, your gladrags and your glitter ball. Time to Roll Away the Stone and get on down to Devil Gate Drive for some Rock n Roll Suicide. How many record stores can you name from the C20th. 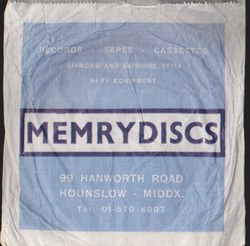 Before HMV and Our Price we used to go mad for Memrydiscs down my way, The listening booths, the racks, the ancient counter staff. It smelt of heaven.